Priced from £20,380 OTR, the range-topping SE L adds even more equipment and delivers one of the most comprehensive specification lists in the sector. 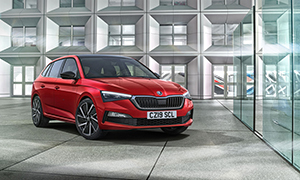 It includes ŠKODA’s new Amundsen infotainment system with 9.2-inch glass touchscreen, digital cockpit, climate control air conditioning, keyless entry with start/stop and a colour multifunction trip computer. The exterior design features 17-inch alloy wheels, full LED rear lights, dynamic indicators and privacy glass on the rear windows. Inside, the seats are finished with silver Microsuede trims and chrome details on the dashboard, door panelling, gear and handbrake lever.